On 24/3/2014, Albawaba newspaper, Chief Editor Abd Elrehim Aly, published a video of Abu Obaida Muslim Brotherhood element, who admitted joining the Muslim Brotherhood Organization and was receiving instructions from the organization to target police, army individuals and their families. He also confessed eye-witnessing torture of civilians in Rabaa and Nahda squares (MB armed sits-in, disengaged on 14/8/2013). And exploiting Children in violent protests and in surveying police elements residences and families. 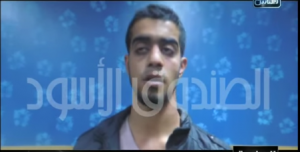 Abu Obaida confessed that he joined Muslim Brotherhood and he formed a group from his followers and instructed them to burn police individuals private cars in the 10th of Ramadan city in Egypt and to target their families too. He also said that it was very easy for him and his group to target Police individuals and their families because Muslim Brotherhood provided him with names and personal addresses of the targeted police individuals. He said that his group also had similar activity in Sharkia city of targeting some of the security checkpoints and police centers. He was also charged of hiring children to participate in MB supporters violent protests and surveying police and military residences, and used children in surveying families of police individuals. Abu Obaida informed investigators that he joined Rabaa and Nahda squares Sits-in and he eye-witnessed Muslim Brotherhood brutally torturing civilians in Rabaa and Nahda sits-in. He confirmed that Muslim Brotherhood were heavily armed in both squares sits-in and he eye-witnessed MB arms and ammunition like machine guns, the day of the disengagement of Rabaa sit-in. He eye-witnessed snipers in the square, they were on the roof of Rabaa’s mosque carrying machine guns and shooting at the military’s helicopters. He also eye-witnessed Muslim Brotherhood elements by the square’s gates were shooting at the police forces too. He also saw weapons stored in Rabaa’s kitchen in the square. He mentioned that he knew and met top leaders from the brotherhood organization and their political party, because he was responsible for Rabaa’s stage and leading some of the demonstrators in violent protests. He added that the day of the disengagement, he saw a military vehicle entered the square, and Muslim Brothers took over the vehicle after they shot and injured military soldiers and stole their weapons. Another video, dated 17/3/2014 published by Albawaba news, exposing Muslim Brotherhood exploiting children in terror attacks. Child name, Ibrahim Ahmed Abd ElAziz, 15 years old, school’s student. He told investigators that he met with Abu Obaida in one of Muslim brothers protests. Abu Obaida hired him to survey the residence of Officer Mohamed Elbaramawy, and residence of Officer Issam Zeid, and some police check points. Ibrahim told investigators that the purpose of surveying police officers residences, was to bring complete information about their families, whether they have kids or not, what time they leave home and when they get back from work. He added that before he got arrested, Abu Obaida told him and others in the group that he was going to take them in an Area in Bilbis by the mountains, to get some training on how to use weapons and grenades to attack and kill police and military individuals.